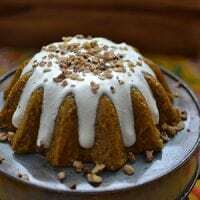 And this creamy, sweet pumpkin treat sure made me thankful! This recipe proves that special doesn't have to be difficult. Just stir together all the ingredients, pour, cook, and chill — that's really it! Instant Pot pumpkin pudding isn't like a liquid-y pudding. This one actually holds its shape (kinda like Christmas pudding), so it's just as much eye candy as it is yummy for your tummy. For instance, you may have noticed that gorgeous white liquid running down the sides… That is a lovely (and sugar-free) Coconut-Ginger Glaze. May I humbly suggest that you do not skip this step? 😉 It balances the sweetness of the pudding so nicely, and the ginger is just the right accent to the pumpkin and the coconut. The crispy walnuts on top add the perfect crunch. Make your holiday table beautiful with this simple, elegant dessert — Instant Pot pumpkin pudding. It's dairy-free, gluten-free, grain-free, and low in sugar, so I say it counts as breakfast, too! Make your holiday table beautiful with this simple, elegant dessert. It's dairy-free, gluten-free, grain-free, and low in sugar, so I say it counts as breakfast, too! Serves 5. Add milk to a saucepan. Turn heat to medium-low to gently heat the milk. Whisk the milk to dissolve the gelatin. In a medium size mixing bowl, combine the milk + gelatin, pumpkin, coconut sugar, egg, spices, and salt. Then pour into a well-greased 3-cup bowl, souffle dish, or jello mold. Add 1 cup water and trivet to pressure cooker. Place the pumpkin pudding on the trivet. If using an electric cooker, set to high pressure for 30 minutes. With a stovetop cooker, bring to high pressure and maintain pressure for a cook time of 30 minutes. Then once cycle is complete, if using an electric cooker, hit the Cancel button to turn off the heat. With a stove-top cooker, remove from heat. Place a towel over the pressure release knob and allow pot to do a quick pressure release. Then carefully remove the pudding and allow it to cool to room temperature. Do not disturb it while it cools. Next, put the pudding into the refrigerator for 4 to 6 hours, or until it is totally set. Run a butter knife around the edge of the cooking dish and turn the pudding over on to a plate or cake stand. Combine the glaze ingredients by whisking in a small bowl until completely smooth. Then drizzle over the finished pudding. Finally, garnish with crispy walnuts, if desired. Enjoy! Any 3-cup glass bowl, mini bundt pan, or souffle dish will work as the “mold”. I used a vintage jello mold to create this stunning pudding. Just make sure you grease it really well with fat so that the pudding slides right out! Also, I pressure cooked this pudding right in my Instant Pot, so whatever dish you use needs to fit inside your pressure cooker, and be easily removed. 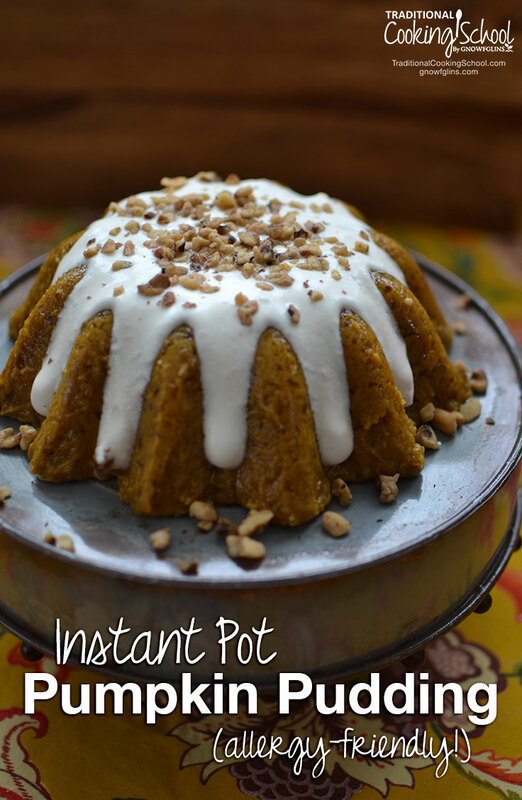 Do you think you'll enjoy this Instant Pot pumpkin pudding for breakfast or dessert? Would Clear Jell work as the gelatin? I am the winner of the Insta Pot given away on a recommended site where Wardee taught once a month cooking. My daughter is really enjoying it! Now we can both learn together! Thanks! I’m not familiar with that product, as I only use pure beef gelatin from a sustainable source. If it’s meant for Jello, however, it should work. I have a longstanding candida situation. I cannot do erithrotol. I am very cautious about adding any sweetener to my diet. What about yacon syrup? I am not familiar with yacon syrup and have never used it, Barbara. If you tolerate it, give it a try and let me know how it works for you! Can you point me to information onwhy i shouldn’t use eirithrotol when you have Candida? That’s the first I’ve heard of that and have been using that combined with Steviafor over year. Thank you! Val, using sugar alcohols is dependent on a per person basis. Just because Barbara doesn’t tolerate or want to use them doesn’t mean they’re bad for you or everyone. Sugar alcohols CAN cause digestive distress (gas, bloating) for some. In fact, I tolerate erythritol just fine, but xylitol upsets my stomach. I have also dealt with candida and did not find erythritol to be an issue. It’s a case by case decision, and you have to make the best choice for YOU. I still only use erythritol + stevia. In fact, I tested that combination in this recipe, and it worked beautifully! Hope that answers your question! For those who prefer not to use beef products, agar agar works as a gelatin substitute – it’s derived from plants/seaweed. I was excited to see “allergy-friendly” recipe, only to find out it is only referring to a couple of the allergies (gluten and dairy). As a mom that has a child with allergies to eggs and tree nuts, this is definitely not an allergy friendly recipe, unless I modify it . What an amazing recipe, I will definitely try this asap. I was just wondering: is there really no flour involved whatsoever? Not a spoonful of coconut flour to soak up the fluid, or some almond meal to give the pudding some texture? Is it really just pumpkin, an egg, coconut milk and gelatin (i.e., other than the spices, no dry ingredients)?